My Anthony Bourdain Moment in Singapore. It won’t be just foodies who’ll miss the recently departed Anthony Bourdain. Travelers, too, will feel deprived of his Peabody-winning writing and his TV work, having spent years vicariously walking and eating in Bourdain’s footsteps as he made his way through the world. Street food and its providers were a cause close to Anthony Bourdain’s heart. 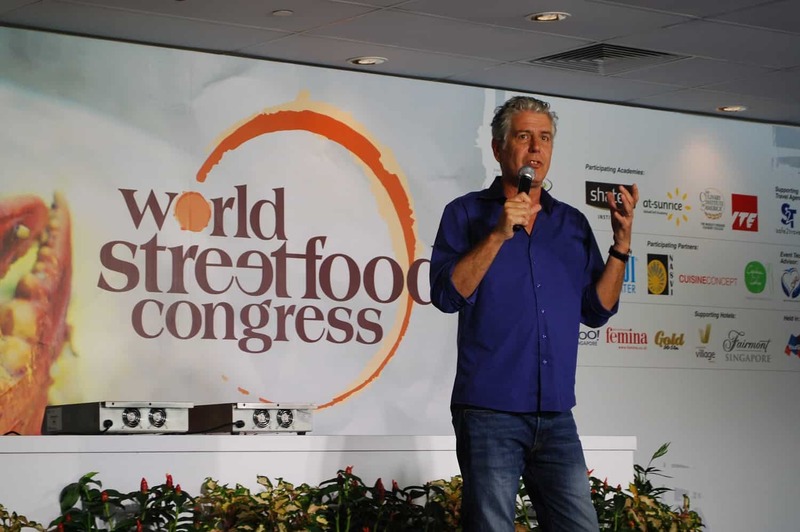 I had the privilege of hearing him talk about it with enthusiasm, when he keynoted the 2013 World Street Food Congress organized by K.F. Seetoh and Makansutra. To hear him speak about it, the act of making and eating street food can create personal connections where there was nothing there before. “What I found, again and again, simply by exhibiting a willingness to show up and ask the simple questions – ‘what do you like to eat? Would you like to eat some now? Let’s enjoy it together’ – people open up in extraordinary ways and tell us things about themselves that go far beyond the meal,” he told us. 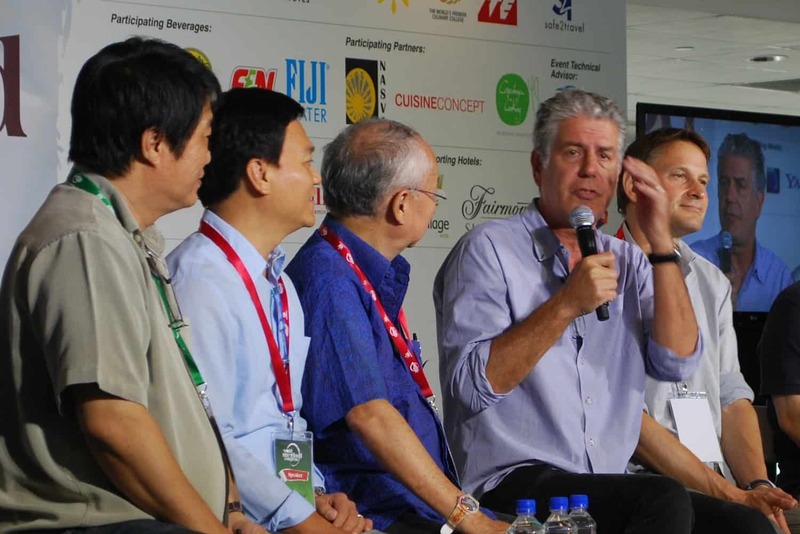 Anthony Bourdain at a panel discussion in Singapore, 2013. For Bourdain, food was more than a sense of place or a neat way to make a living – food tells a story, and like many stories, some parties surprisingly have an interest in keeping it under wraps. “The implications of what we’re talking about here: of what we eat, the foods we celebrate: can mean a hell of a lot more than what we put up on Instagram,” remarked Bourdain, who went through a strange experience shooting No Reservations in Egypt, not long before the crowds at Tahrir Square ousted Hosni Mubarak. Long story short: the producer faked an intense gastrointestinal attack, and while the handlers were rushing the guy to the hospital, Bourdain and the remaining crew strolled over to a corner ful stall to shoot the contraband footage. What was so subversive about eating ful? “This is the everyday food that most Egyptians get: a little bowl of beans, and a big stack of bread,” explained Bourdain, who realized that it wasn’t the ful-eating per se that bugged the censors, it was what would be airing alongside the shot. How would the stark, simple ful fare against shows like “Man V. Food – pudgy white boy shoving more animal protein into his face in nine minutes than most families in the developing world get in nine months?” wondered Bourdain. “I think [the handlers] thought – and they were right – people in Egypt are going to see this, they were going to see our show in Paris, with cheese and all that nice roast duck, they see Adam Richman shoving a nine-pound hamburger into his face, and then our show!” Bourdain exclaimed. “Egypt! ‘Our’ country! And what do they see? A bunch of Egyptians sitting there – themselves – eating a big stack of flatbread dipped into beans. “They’ll go: ‘You know what? That’s what we eat! Our country’s fucked up! Let’s overthrow our government! '” Strategic pause. “So I’m not saying I’m personally responsible for the Arab Spring…” deadpanned Bourdain as the crowd roared with laughter. I was sad to hear that Bourdain had taken his own life. 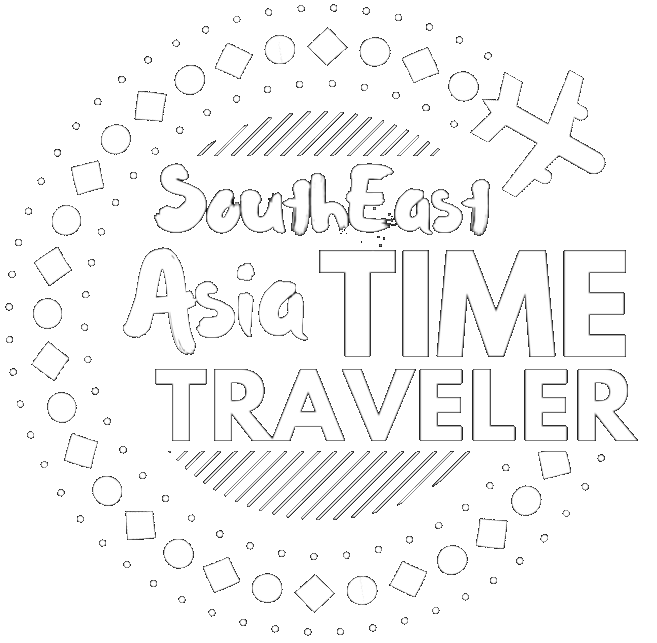 The world’s connection to a great, adventurous, subversive soul has, in an instant, been irretrievably lost.